Demonstrative adjectives include the words this, that, these, and those. Teach your child all about them on this straightforward worksheet. A predicate adjective modifies the subject of a sentence. Help your beginning reader to identify the predicate adjective in these sample sentences. Can you come up with a few adjectives to describe yourself? This worksheet will encourage kids to think of adjectives that describe themselves in a fun format. Adjective clauses are easy to find in a sentence -- if you know how to look for them. 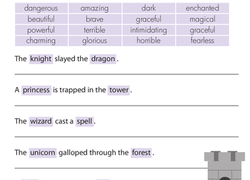 In this adjective clause worksheet, you're the grammar detective! Snail stories sound so silly! Your child will learn about alliteration by filling in the blanks with adjectives and nouns that start with S.
A lucky lizard loved the lazy ladybug? Your third grader will love learning all about alliteration with this fun fill-in-the-blank worksheet.